I really enjoy sketch challenges, and this week's CAS challenge is no different. The sketch comes from a card by 1busymomof2. I'm in Christmas mode right now, and I wanted to make something using the Holiday Lounge designer paper. 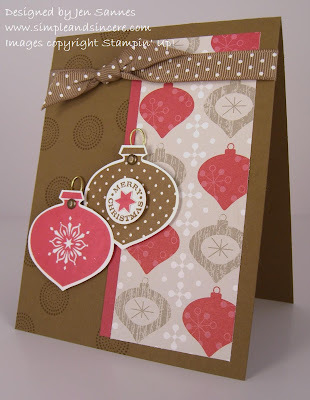 This paper coordinates really well with the Delightful Decorations set and I love the non-traditional Christmas colors in this designer paper. For this card, I combined Soft Suede, Ruby Red and Whisper White for a crisp, modern feel. Hop on over to the CAS challenge forum to check out the other DT samples and play along! Love this card Jen! Soft suede and ruby red go great together and that DP is outstanding and oh so perfect with those ornaments! !